Chris Wagner scored the go-ahead goal 5:27 into the third period, giving Boston goaltender club record with his 252nd career win. BOSTON — Tuukka Rask always tries to focus on the next win. This time, he made an exception. 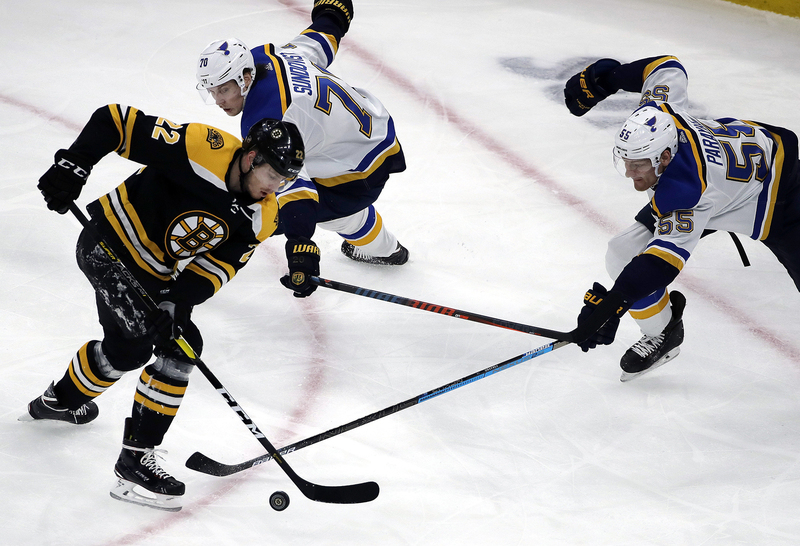 The 31-year-old goaltender tied a Boston record with his 252nd career victory as the Bruins beat the St. Louis Blues 5-2 on Thursday night. Rask made 28 saves and matched the franchise mark set by Cecil “Tiny” Thompson, who was 252-153 with 63 ties. Rask, the 2014 Vezina Trophy winner as the NHL’s top goalie, is 252-145-56 in 474 games over 12 seasons with Boston. Thompson won his 252nd game in his 11th and final season with the Bruins in 1938-39. He died at age 77 in 1981, six years before Rask was born. Chris Wagner scored 5:27 into the third period to give the Bruins a 3-2 lead. Brad Marchand and Sean Kuraly added some insurance after earlier Boston goals from Torey Krug and David Backes. “We got the go-ahead goal and after that we were flying and didn’t give them a whole lot,” said Rask, whose team had lost three of four (1-2-1) after a season-high five-game winning streak. Ryan O’Reilly and Carl Gunnarsson had the goals for St. Louis. Jake Allen made 22 saves. Blues left wing David Perron extended his NHL-leading and career-best point streak to 13 games (six goals, 10 assists) with a secondary assist on O’Reilly’s goal. St. Louis had won four of six (4-1-1) and earned at least one point in each of its previous five road games. The Blues finished a 2-1-1 trip after starting it with back-to-back wins over Dallas and Washington. Wagner’s tiebreaking goal came after Jakob Forsbacka-Karlsson’s pass from the opposite blue line put him a step in front of Blues captain Alex Pietrangelo. Wagner deked to put Allen off balance before tucking the puck under his glove. “He kind of just chipped it to me, I tried to knock it around Pietrangelo and fortunately got by him and made a nice move and just tucked it in,” Wagner said. Marchand ripped in a rebound after Charlie McAvoy’s wraparound attempt bounced off Allen’s pads to make it 4-2 with 6:48 remaining. Kuraly tacked on an empty-net goal with 51.5 seconds left. Krug’s uncontested wrister from the slot gave Boston a 1-0 lead 3:31 into the second period. St. Louis tied it 53 seconds later when O’Reilly tucked in his own rebound from the right of the crease after Rask got a glove on his first attempt. Gunnarsson gave the Blues a 2-1 lead when he capped a give-and-go with Jaden Schwartz with a one-timer from the left circle with 6:24 to play in the second. Backes, a former Blues captain, got a piece of Zdeno Chara’s slap shot to tie it again with four minutes left in the period. Backes’ goal came with four seconds left on a Bruins power play following Robert Bortuzzo’s cross-checking penalty. NOTES: Gunnarsson missed the previous three games with an illness. … St. Louis LW Zach Sanford (concussion protocol) did not play after being slammed into the boards during Tuesday’s game against the New York Islanders. … Boston C Ryan Donato received several stitches to close a cut under his nose after taking a hit from Philadelphia center Jordan Lehtera on Wednesday. … Bruins C Joakim Nordstrom (fractured fibula) had a maintenance day after skating Wednesday and could return after the bye week. … Backes, who returned after sitting out Wednesday as a healthy scratch, spent his first 10 NHL seasons (2006-16) with St. Louis. The 34-year-old Backes ranks sixth on the Blues’ career goals list (206) and seventh in points (460). … The Bruins held “Hockey Is For Everyone Night,” celebrating diversity throughout the sport. Blues: Host the Ottawa Senators on Saturday night. Bruins: Host the New York Rangers on Saturday night.